Daily and Weekly: Reservations are taken with a $35 deposit. Monthly: Reservations are taken with a $95 deposit. Reservation must be cancelled at least 30 days prior to start date or your deposit will be forfeited. 6-Month Rentals: Reservations are taken with a $195 deposit. Reservation must be cancelled at least 60 days prior to start date or your deposit will be forfeited. Home Rentals: Reservations Required. $495 deposit. Need to Cancel? 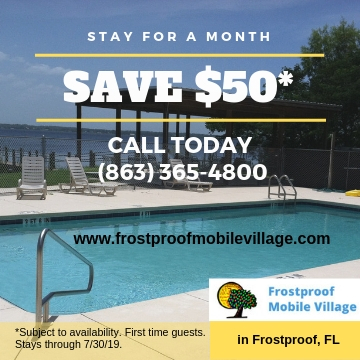 Please call (863) 635-4800 before the above deadlines to receive your deposit refund, less a cancellation fee of $35 (or $25 in case of daily or weekly reservations). Storage may be available upon request subject to availability.